In the late 1980s, I was introduced to one of my favorite tech anagrams: WYSIWYG. Truth be told, I liked the phrase more because it could be pronounced “wissy-wig," than for the fact it stood for “What You See Is What You Get." The reason I bring up WYSIWYG is because of its relation to memorabilia cards. Whatever you call them, memorabilia, game-used, swatch, relic, patch, jersey cards--these are the cards that brought me back into the hobby five years ago. I was lured by the chance of owning a piece of history. Although I still was a lawyer when I started collecting memorabilia cards, I blindly trusted they were authentic swatches of jerseys, if not swatches of the jerseys pictured on the cards. Yes, even lawyers can be naïve, especially when it comes to their own lives. Haven't you ever heard the saying that a lawyer who represents himself has a fool for a client? Quickly, I realized memorabilia cards are not necessarily WYSIWYG. They're actually WYSIAYG: What You See Is All You Get. Because sometimes what you get is just an unidentifiable piece of fabric from who knows where. But before we get there, a bit of history. It's amazing to think, but memorabilia cards were invented in 1994 and have only been available to collectors since 1996 and hitting the mainstream in 1997. During that timeframe, they've gone from being high-demand items to, often, inserts that are merely tossed aside. Although the proliferation of memorabilia cards has played a big part in their depreciation, there's another reason that's contributing as well. It can be blamed on the increasing vagueness of the legalese on the cards themselves. “On the front of this card is an authentic piece of a jersey worn by Steve Nash as a member of the Dallas Mavericks in an NBA game." Legalese translation – There is very little to translate here. Steve Nash wore the jersey in an actual NBA game from which the swatch was cut. While you can't pinpoint the game or the season but you still know it was game-used. Heck, you could probably smell the body odor too if it wasn't washed prior to cutting. “You have received a trading card with Game-Used memorabilia that includes an autograph of Asher Wojciechowski. 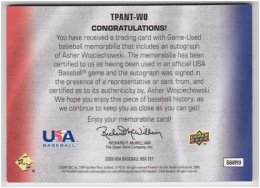 The memorabilia has been certified to us as having been used in an official USA Baseball® game and the autograph was signed in the presence of a representative or sent from, and certified as to its authenticity, by Asher Wojciechowski." Legalese translation – Although the disclaimer is from the same company as the Nash card, this one is murkier. The autograph certification is pretty good—either the player or his representative vouched for it. The game-used memorabilia is less clear. It's from a USA Baseball game, but that's really all you can take away from it. You have no idea what game it was worn in, or what year. In fact, there's no guarantee that the patch was part of Wojciechowski's uniform or if it belonged to someone else. And I used the word uniform intentionally because there is no guarantee this is even a swatch from a jersey. Heck, as vague as the disclaimer sounds, it could be from a sock for all we know. And really, a close reading makes it worse. Upper Deck isn't certifying that the memorabilia is authentic. Upper Deck is saying an unnamed individual certified to Upper Deck that this memorabilia is what they say it is. Witness: “Someone told me the patch on this card is cool." Attorney: “Do you know this for a fact?" Witness: “Uhh, no. I only know what I've been told." And that's why hearsay, normally, is inadmissible. But apparently, it's good enough for memorabilia cards. Now, I'm not saying this card is not a swatch of Wojciechowski's jersey. It very well could be. But Upper Deck by no means establishes that fact with its choice of legalese. “You have just received a Minor League materials game-used memorabilia card from 2011 Topps Pro Debut….The relic on this card is not from any specific game, event or season." Legal translation – I mean, first things first: you can tell the disclaimer is going to be good just by how small it is in comparison to the rest of the text. This text is miniscule. I think it's the equivalent of the last five seconds of every car commercial on the radio where an incomprehensible voice babbles in a blur, “EverythingIJustSaidisKindaBS." Turning to the actual disclaimer, what the heck is this patch? It's not from any specific game, event or season? I mean, how enjoyable is memorabilia if Topps can't even point to a specific game, event or season that it came from? If I was a philosophy major, I would argue this disclaimer proves this patch doesn't actually exist. And it's not like it would be hard to vouch for where this patch came from. Heck, when this card came out, Moustakas had only played for Omaha in 2010, so it shouldn't be that hard to nail down a time frame for the patch. That is, if it is a piece of Moustakas' Omaha uniform. The disclaimer is so vague, it might not even be a Moustakas swatch. It's just a “Minor League Materials Game-Used" swatch. The way the disclaimer reads, it could be from the bat boy's sock. As part of this article, I was going to dive into an analysis of why I believe the legalese changed into disclaimers (citing consumer fraud statutes and the Lanham Act), but that's unnecessary because the thing boils down to card company laziness. The law really only requires that if a company makes a representation, it better be true. So, the card companies' legal disclaimers really show us how much effort they are willing to put into their respective memorabilia cards: not much. In the long-term, this is not in their best interests. Card companies should consider the less effort they put into the cards, the less demand those cards will receive from collectors. “You are now the proud owner of a Press Pass rookie relics race-used tire and sheet metal card. 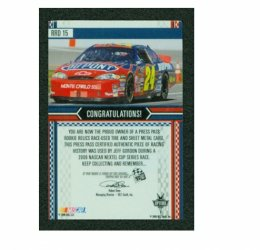 This Press Pass certified authentic piece of racing history was used by Jeff Gordon during a 2006 NASCAR NEXTEL Cup Series Race." Legal translation – Here, you know the racer, the season, and what the card is. That's pretty good. It would be better to know the actual races too, but beggars can't be choosers. Again, while I may be pointing out the problem, I'm going to offer a couple of solutions. Maybe there needs to be an industry standard adopted for “game-used." MLB, NBA, NFL, NHL and all the other license holders could adopt a game-used definition that licensees must follow. Or, maybe, as I've suggested above, card companies need to take the extra time to personalize the legalese on each card to specifically say what the items is. Even better, link it to the photo on the card. “You have received an authentic bikini swatch card. This card contains a piece of an authentic bikini worn by Jamie Bergman. This certificate expressly warrants the authenticity of the piece of bikini on the front of this card." Signed by Brian Wallos, President of Bench Warmer International, Inc."
Legalese translation: Holy crap! And not just for the picture, but for how Bench Warmer bends over backwards to explain what the patch is. Also, the person certifying the authenticity is identified. Now, it's not sports, but if you wanted to be able to pinpoint where this patch came from, you can. Sure, it's not game-worn, it's from a photo shoot. But the card serves as an example that establishing a link with the patch and the photo can be done. Now-defunct entertainment card manufacturer, Inkworks, did this as well. The swatches from their costume cards matched the screenshot shown on the front of the card. As a rule, if they couldn't see the costume on-screen, they wouldn't use it. “The enclosed piece of jersey was cut from an Authentic Jersey personally worn by Mike Kafka on 5/22/10 at the NFL PLAYERS Rookie Premiere." Legalese translation – You know exactly what this is. Who, what, where and when. Nice. This is what card companies need to get back to doing consistently. The more they can link memorabilia to an actual event or the picture on the card itself, the better. This ties the card owner to a piece of history, not an unidentifiable piece of who knows what. Once the card companies make an effort to do this, there will be a resurgence in the popularity of the memorabilia card. I seem to recall Playoff, in the early days of memorabilia cards, actually putting a photo of the intact uniform piece on the back of the card as part of the coa. Now we have come all the way to a product in 2010 where Topps basically said “this was used in some stadium at some game for some purpose” in vague enough terms that it could have been a shirt worn by a fan. I agree with you, a better attitude from the manufacturers would lead to more interest from collectors. I own a card from a pack of 2003 fleer tradition on the front side it has a game worn jersy piece of chipper jones but the back is upside down and says congradulations you have a piece of a game worn jersy of chipper jones and it has his yearly stats and what someone would expect,i have never heard or seen another one like it. I have looked everywhere. Has anybody ever mentioned this card or have one ? Upper Deck back in 2003 put a non game worn Whitey Ford jersey on a card, and when I challenged that it wasn’t flannel Upper Deck said the jersey piece was from an old timers game, so it was game used. After that I realized there were way too many jersey cards of certain players for them to be real. Even the best most honest experts are wrong, as in the end jerseys are clothing. I even once bought a game used jersey directly from the Orioles at their fan fest that was not used in a game.